Over three days, His Eminence the 7th Ling Rinpoche visited Sravasti Abbey. And what a joyful visit we had! Rinpoche wanted to see everything, so his Abbey tour included a peek into public and private rooms and a bumpy ride through the forest. It was a time filled with teachings and learning. And, of course, repeated requests for Rinpoche to return. Ling Rinpoche’s visit made an auspicious connection for the Abbey and all our friends who attended. The 7th Ling Rinpoche was barely a toddler when he was recognized as the reincarnation of the 14th Dalai Lama’s senior tutor. You can read about Rinpoche’s discovery and his previous incarnation, the 6th Ling Rinpoche, whom His Holiness the Dalai Lama calls his root guru. The 6th Ling Rinpoche also gave novice ordination to a particular young American nun. He named her “Thubten,” after his own lineage and “Chodron,” which means “the lamp of the Dharma.” Decades later, after this nun founded Sravasti Abbey and began to ordain nuns, they also received the name “Thubten.” Thus the link to the Ling Rinpoche lineage is strong for Abbey monastics. Chenrezig Hall’s dining room was packed the next day when Ling Rinpoche gave his main teaching on “A Song of the Four Mindfulnesses,” a text by Kelsang Gyatso, the 7th Dalai Lama. About 100 people attended. “I would like to offer my prayers aspiring for each and every one to live their life here according to the Dharma, that you’ll have no obstacles to your lives and that all of your wishes and aspirations will be fulfilled.” (You can watch the teaching here.) See the photos. After the teachings, Rinpoche toured the land and buildings with the community. He was eager to accept the ride up the steep hill into the forest, and asked lots of questions about what he was seeing. It was a joy to share Sravasti Abbey with him! See more photos of the tour. 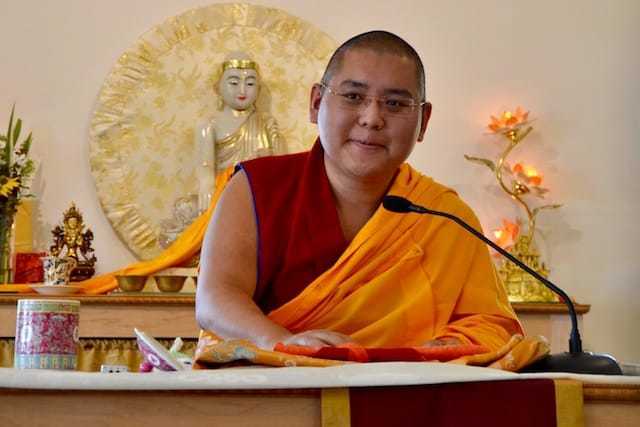 The next day, Rinpoche gave one more talk at North Idaho College entitled “Where Cultural Identity and Interdependence Connect.” Students, townspeople, Abbey monastics, and Abbey guests made up the audience of about 70-75 people. Rinpoche’s talk was general in that he spoke about the shared human values of love and compassion that are so important across cultures, religions, and philosophies. His talk was specific in that he emphasized each person’s responsibility to enact these values—and teach them—in their own lives. “Nobody talks about love and compassion these days,” he said. “They talk about nuclear weapons, money, a billion dollars, two billion dollars, a hundred billions dollars, power struggles. When leaders meet, they don’t talk about how to make a better society or a healthier society. They neglect the environment.” Even though love and compassion is the only solution for making a better world, he said, “That is a major problem. So we have to make awareness in our society of how important love and compassion are.” Watch the talk here. After a lovely lunch with the Coeur d’Alene Dharma Friends, we saw Rinpoche off to the airport on his way to teachings in Mexico. H.E. Ling Rinpoche’s visit was a blessing for the Abbey, and we look forward to his return in the future.